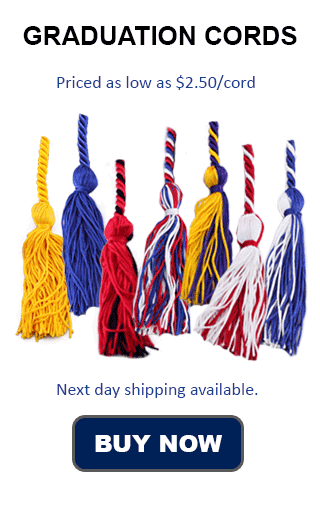 Alpha Kappa Mu Graduation Cords are Royal Blue with White in color. These are the colors of the National Honor Society Alpha Kappa Mu (AKM). Royal blue and white honor cords, available at Honors Graduation, are double tied cords made up of one royal blue cord and one white cord tied together in the middle with an overhand knot. The resulting appearance from the front, when worn, is that of two separate graduation cords, a Royal Blue one and a White one. This is called a double cord. To order one of these, once on the ordering page, make sure "double" is selected first. Then choose your first color (Royal Blue) and your second honor cord color (White) from the dropdown lists. Alpha Kappa Mu is a National Honor Society with over 70 chapters at Universities and Colleges, mostly public, and mostly in the South and Midwest. Membership is open to undergraduates who are Juniors or Seniors and have at least a 3.3 GPA and in the top 10% of his or her class. For Graduate Students the requirements are either entering graduate school having at least a grade point average of 3.3 and top ten percent of the class for their undergraduate degree or have at least 15 credits and a 3.7 GPA if they are a continuing grad student. The National Honor Society Alpha Kappa Mu was started in 1937 by Dr. George W. Gore, Jr. at Tennessee A&I State College. It is not a disciple specific honor society, so students can join from all areas of study, assuming they meet the minimum requirements. Since AKM's colors are Royal Blue and White, it could be said that a royal blue with white braided cord could be an option for them as well, or at least it would show the same colors, only in a single cord instead of a double one. Another option would be to have two braided royal blue and white graduation cords tied together for a double honor cord.